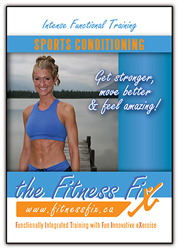 I am very excited for you to begin the Sports Conditioning Fitness Fix video – Optimal Functional training and toning. This video is excellent functional and core stability training for any individual wanting to prepare for sport or to improve their strength, endurance, and balance for any activity! Youth, adults, seniors, athletes, and people with joint or muscle problems will all benefit from the safe, effective, and challenging exercises in this video. These exercises are excellent to prepare you for sports, optimize your performance, be used as off season training, to prevent injuries, and to help you get active after rehabilitation with a physiotherapist. These exercises are designed to help balance, strengthen and tone muscles and to help release tight and damaged areas, and to prevent common chronic injuries. Even elite athletes sometime need to break down their training to the fundamentals to build their strength from the core, and this video will help to do that. The Fitness Fix does not have to replace anything you are currently doing – it is designed to supplement anything you do. By doing these exercises your body will look better, feel better and be strong enough to perform the sports or daily activities that you love, for as long as you like, and you will feel energetic, strong, and ready for anything!